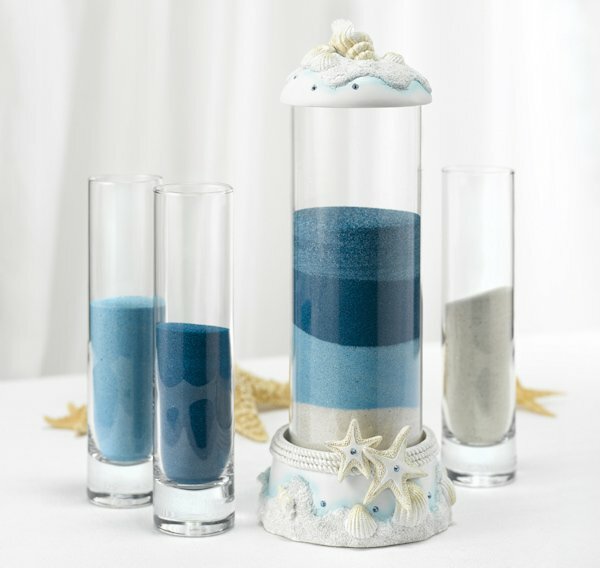 Perfect for your seaside ceremony beach-themed wedding, this four piece wedding sand ceremony kit includes three smaller glass cylinders and a large unity cylinder with stunning beach accents. Starfish and seashells are highlighted with sparkling blue rhinestones within the resin base and cover on the larger cylinder. Small cylinders measure 7 1/2" tall by 1 3/4" in diameter, large cylinder is 9" tall by 3" in diameter (11 3/4" tall by 4 1/4" diameter with the lid and base). 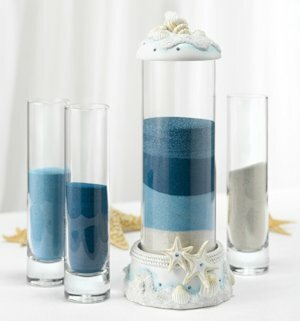 If you need more small cylinders for your ceremony, search for item number 22909.Note: Sand sold separately, search for item number 7083 or 29959.